We love babies. And we understand baby's delicate hair and tender scalp needs gentle care. Improved Johnson's Baby Hair Oil's light and non-greasy formula enriched with Avocado and Pro-Vitamin B5 for hair that looks soft and healthy. Studies show that Ultra Thin baby massage improves mental development and increases alertness and attentiveness of your baby. Also, your baby's first emotional bonds are built from physical contact, and these serve as the foundation for emotional and intellectual development later in life. The gentle baby oil makes it easy for you to give your little one a loving massage and your touch helps in stimulating her senses which is critical for her happy and healthy development. 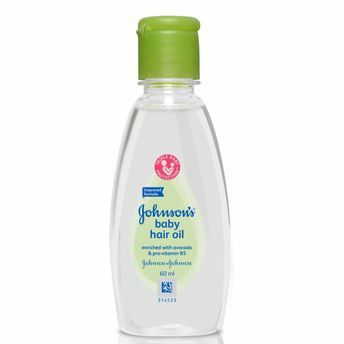 Clinically proven mild ensuring no irritation to your baby's tender scalp. Explore the entire range of Creams, Lotions & Oils available on Nykaa. Shop more Johnson's products here.You can browse through the complete world of Johnson's Creams, Lotions & Oils .Alternatively, you can also find many more products from the Johnson's Baby Hair Oil range.